Austria is a diverse country with a rich history and many traditions, providing for an exceptional cultural experience. The country once occupied a delicate peripheral position between East and West Europe. But after the collapse of Communism and the expansion of the European Community to the East, Austria is considered in the Center of Europe. There is something for every taste and budget in Austria. Its people are friendly and outgoing - the main reason why so many tourists come back over the years. Austria's charm manifest in its grand architecture in Vienna and Salzburg, the attractive mountain scenery in the Alps and its delicious cuisine which derives from a process of intermingling of people and cultures, which at one point in time belonged to the Austria-Hungarian Empire. Austria is located in southern Central Europe. Geographically, its territory encompasses both the Eastern Alps (which cover some two thirds of its surface area) and the Danube (Donau) Region. Austria has a land surface of 83,858 square kilometers (32,369 square miles). Given its location, it has always been a cross-roads of travel routes between the major European economic and cultural regions. 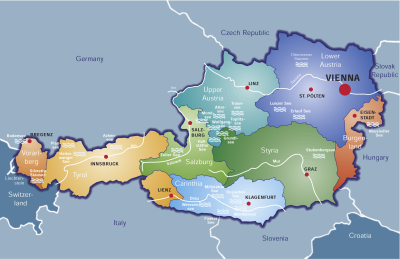 Austria has common borders with eight other countries: Germany, the Czech Republic, Slovakia, Hungary, Slovenia, Italy, Switzerland and Liechtenstein. Austria is a federal state consisting of nine independent federal states: Burgenland, Carinthia, Lower Austria, Salzburg, Styria, Tyrol, Upper Austria, Vienna and Vorarlberg. The Austrian population totals 8.032,926 according to the census of 2001, some 98% of whom are German-speaking. The six ethnic groups officially recognized in Austria are concentrated on the east and south of the country. Burgenland is home to Croats and Hungarians, many of whom have migrated to Vienna. Slovenes are found in the Gail, Rosen and Jaun valleys of southern Carinthia and in some villages in the southern part of Styria. Many Czechs and Slovaks live in Vienna and in Lower Austria, particularly in the Marchfeld and Tullnerfeld regions. Romany and Sinti, who were recognized as ethnic groups in 1993, live above all in Burgenland and to some extent in Vienna. The mean life expectancy (for a new-born of 2001) stands at 81.7 years for females and at 75.9 years for males. Austria is a federal parliamentary democratic republic, with a Federal Chancellor as the head of government, and a Federal President as head of state. Executive power is exercised by the local and federal governments. Federal legislative power is vested in both the government and the two chambers of parliament, the National Council and the Federal Council. The Judiciary is independent of the executive and the legislative, and exclusively federal in nature; there are no state courts.